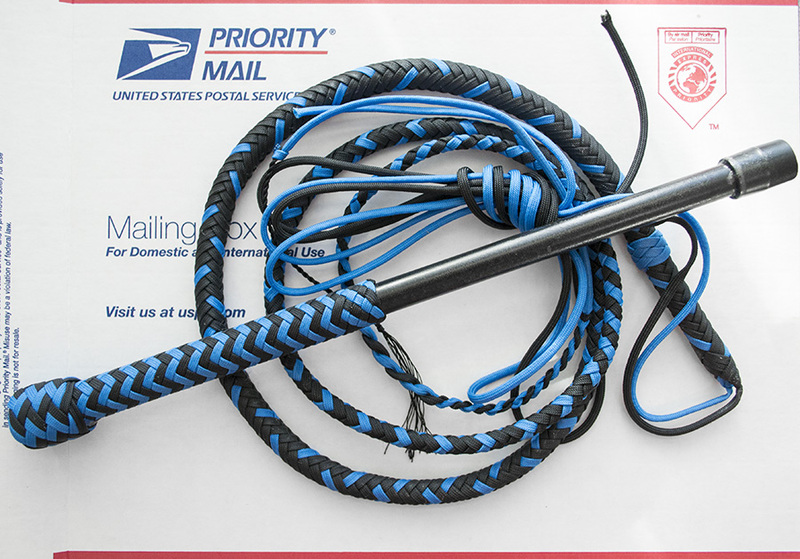 This is Tony’s new Performance Hybrid Nylon Whip made from Black and Colonial Blue Parachute Cord. 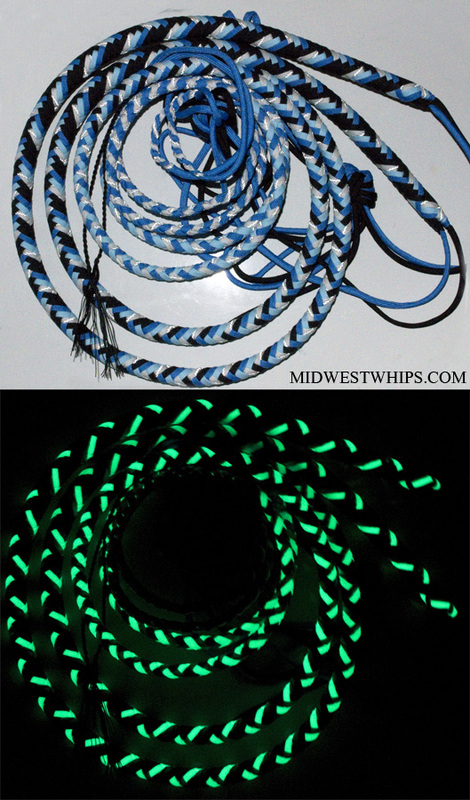 I plaited this awesome custom matched pair of Performance Hybrid Nylon Whips for Lisa with Black, Colonial Blue, Glow-in-the-Dark Light Blue, and White w/ Reflective Tracers Paracord. These whips will really stand out! If you’re interested in ordering a pair of whips like these, check out my Nylon Whips page on MidWestWhips.com for more information. You can also browse this gallery blog for color ideas by using the search bar or clicking on a color you’re interested in seeing more of in the tag cloud to the right. This matched pair of PH Whips was custom made for Ryan using Black and Colonial Blue Parachute Cord. Check out our MidWestWhips Nylon Whips page for more information on how to order your own custom Performance Hybrid whips, or look at our Whips In Stock page to see if we have any already in stock at the moment. This matched pair of 5ft Performance Hybrid Nylon Whips is made from black, colonial blue, glow in the dark light blue, and white with reflective tracers paracord. It’s a little extra expensive to get a hold of fully glow in the dark parachute cord and cord with reflective tracers, but the versatile visibility of the end product is worth it! This brand new matched pair Performance Hybrid Nylon Whips was made for Steven. The paracord colors we used to make these whips were Royal Blue, Black, and Colonial Blue.